Suran was a medium-sized town situated on the eastern coast of Lake Masobi, within the Ascadian Isles. 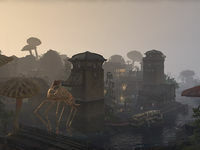 The town was constructed by the Hlaalu Construction Syndic in the mid-Second Era, having been contracted by House Redoran; although some sources indicate that the original settlement had been built long before then. Its architecture resembled a typical Hlaalu market town, complete with a watchtower and a small temple. House Redoran originally controlled the town, but it was later taken over by House Hlaalu. During the late Third Era it served as the northern headquarters for Hlaalu slavers doing business with nearby plantations. Suran also functioned as a stopover for pilgrims and adventurers heading northeast into the Molag Amur region and Mount Kand. The settlement has been in existence since at least 1E 1056.